"The aroma of mashed potatoes will always remind me of dinner at grandma and grandpa's house!" 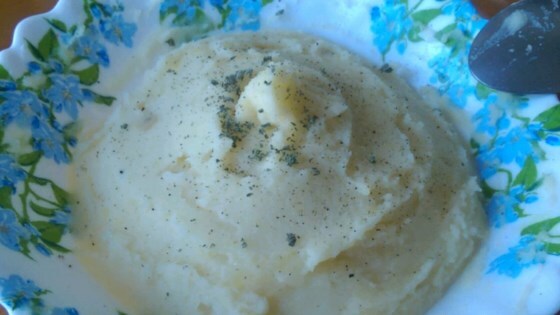 Mash potatoes with milk, sour cream, salt, and pepper in the large pot. Way too much milk when using a liquid measuring cup. I had to dump some of it out and then it turned out okay. 3 potatoes was the perfect amount, because we didn't end up with a crazy amount of left overs (which I loved). We stirred in a few shakes of garlic powder for extra flavor. I just added a few pats of butter, execlent!!!! Very good I didn't have any sour cream so I used cream cheese. Excellent! I used a bit of cream cheese and a spoon of butter, mashed the potatoes with a fork. The food processor makes them too gooey for my taste :) Guests loved them! I used heavy cream instead of milk and sour cream and it was perfect. I'm making this again FOR SURE! The kids love it, and so do I! I just added in cheese to the mixture, and it made it taste delicious!